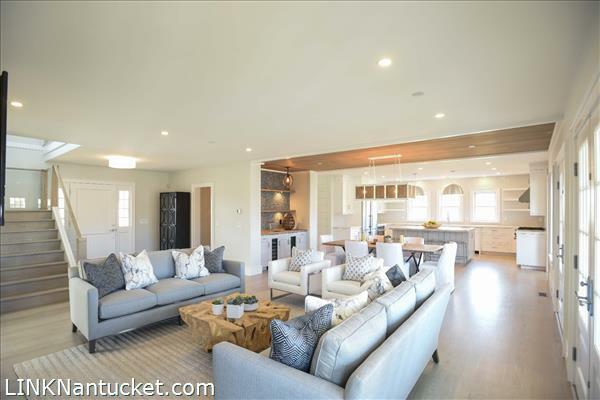 Pippins Way, an exclusive residential enclave located in the coveted Shimmo area, offers the discernible homeowner the perfect summer getaway. 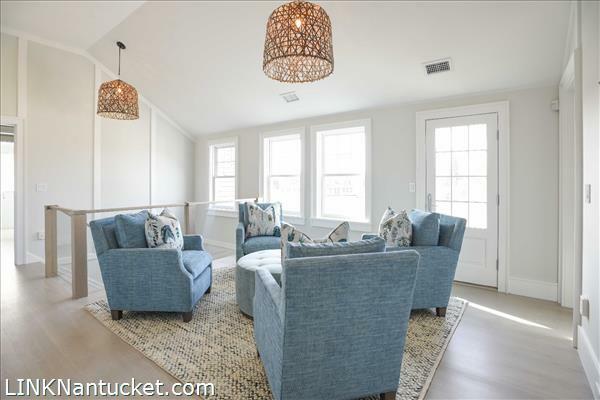 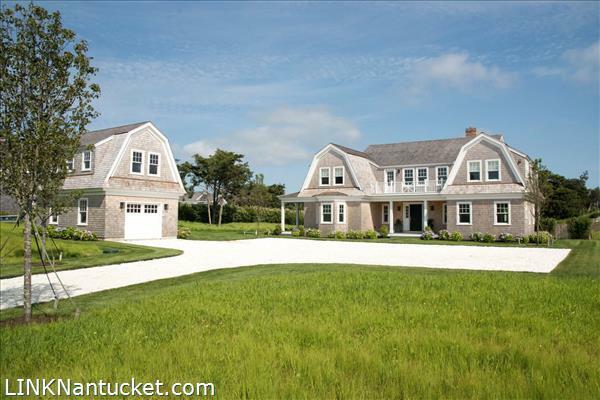 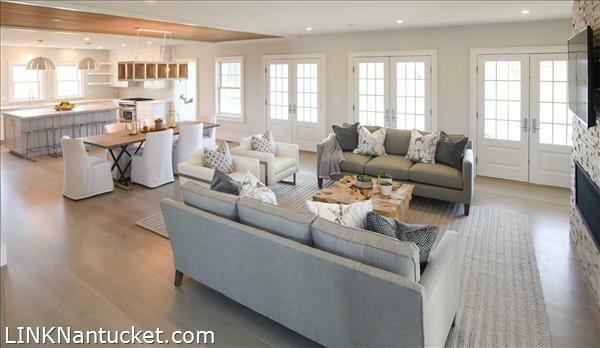 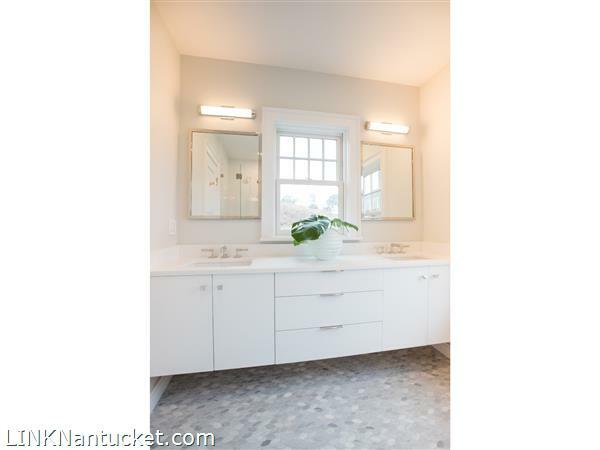 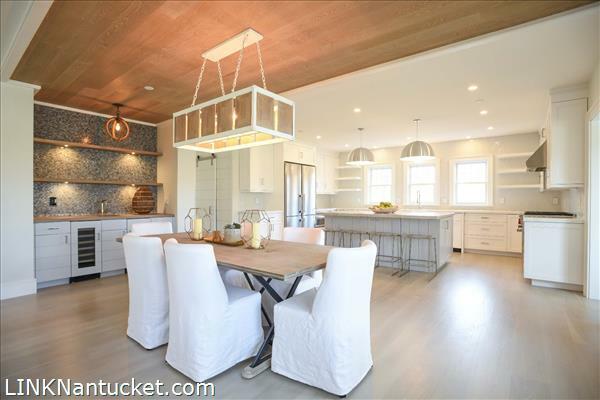 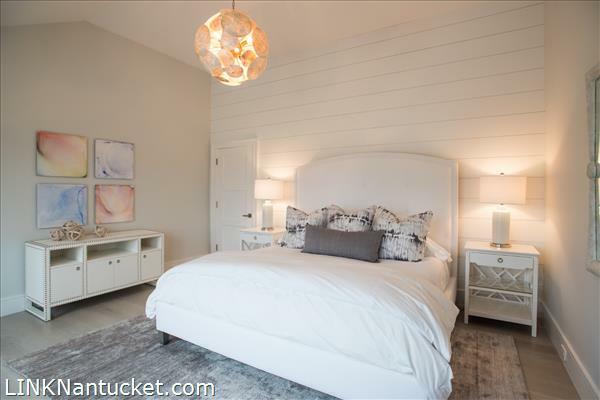 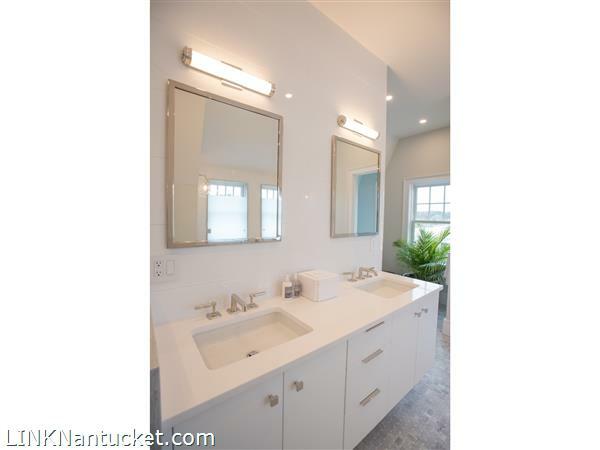 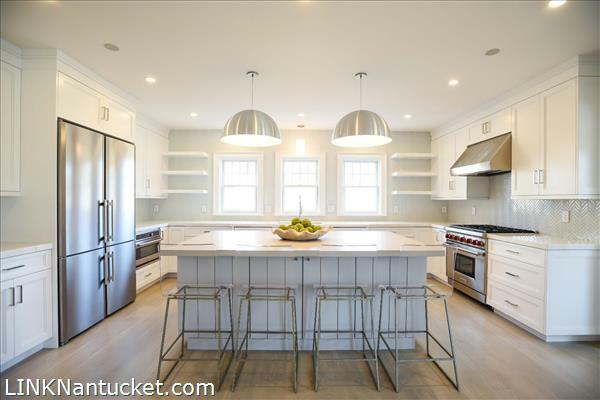 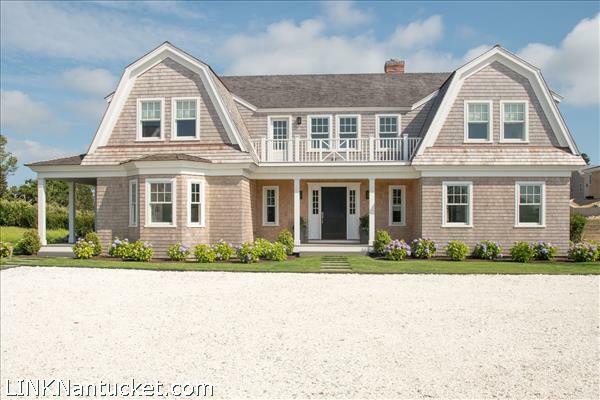 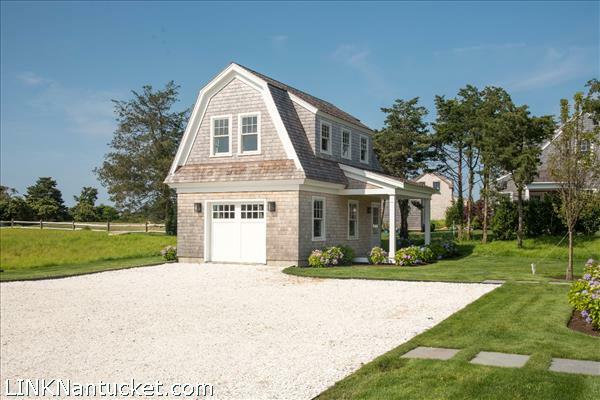 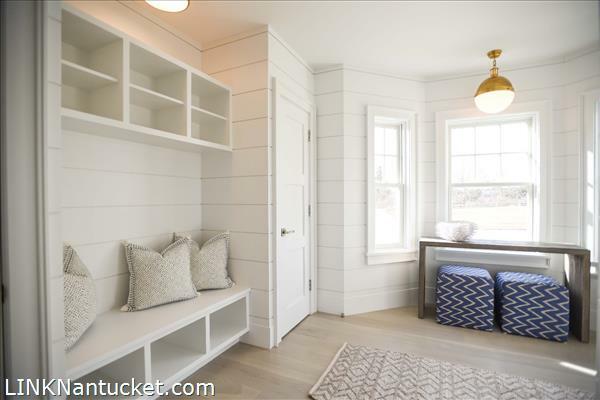 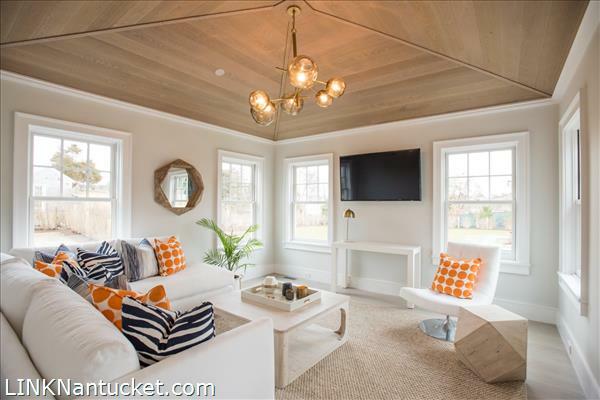 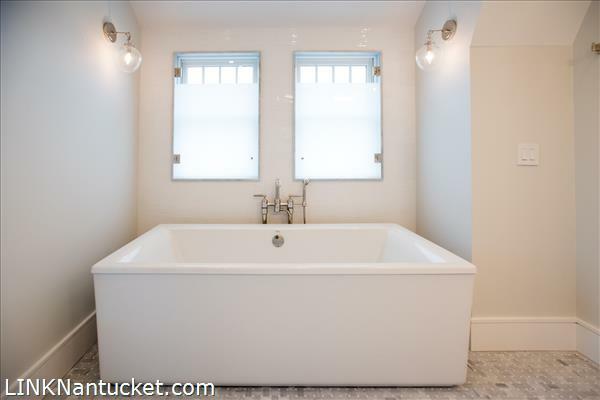 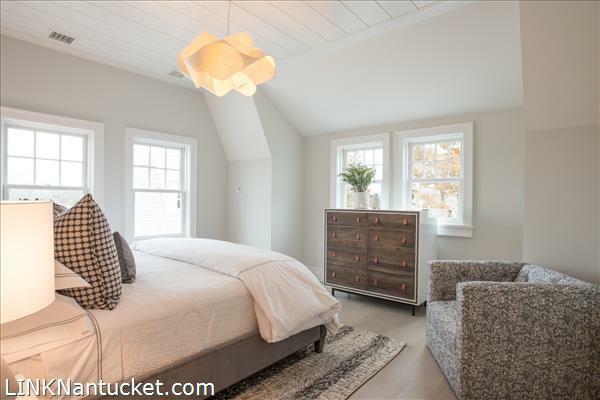 Not too far from the heart of Nantucket, this 5 – bedroom, 5.5 – bath home has been thoughtfully created by Clarke Brothers Construction and features fine craftsmanship throughout with many custom details. 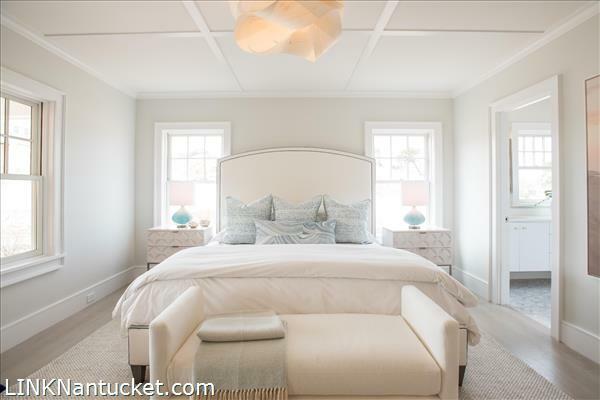 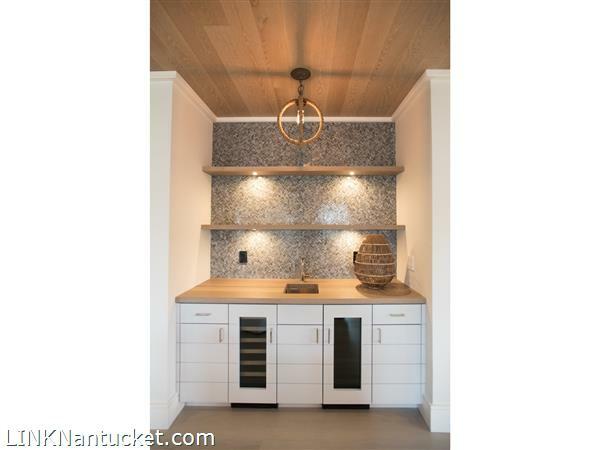 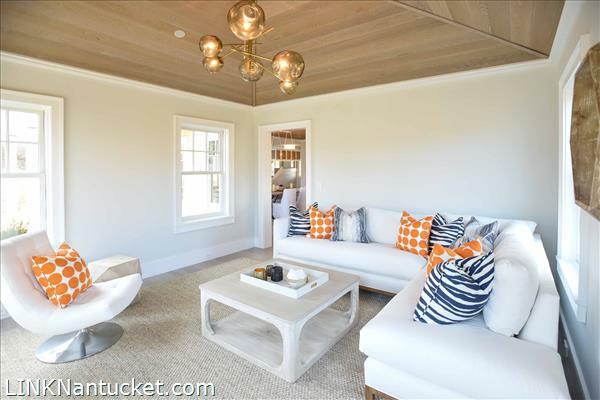 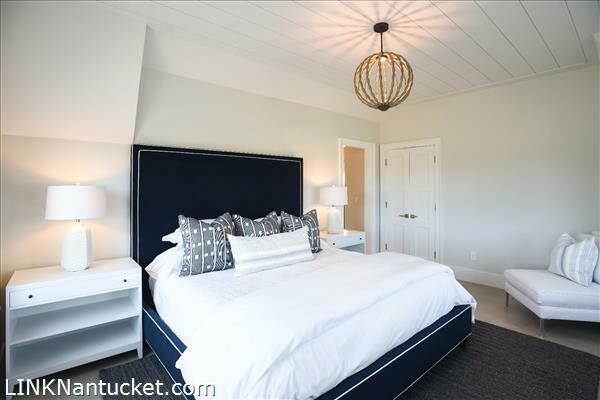 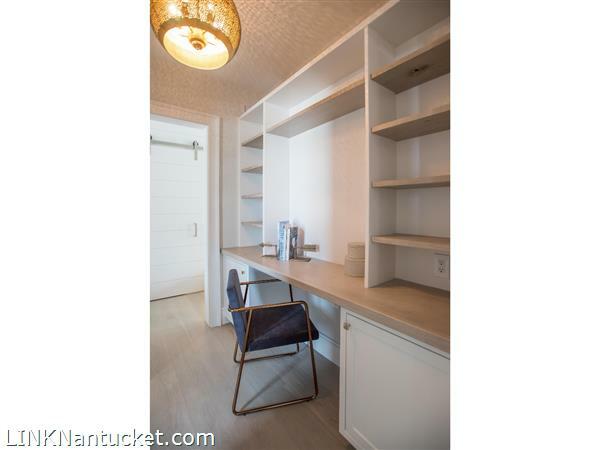 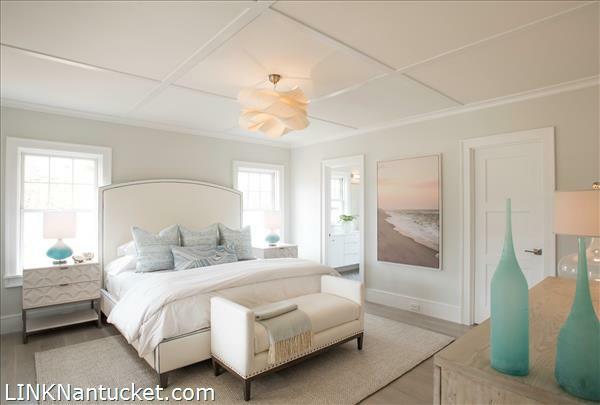 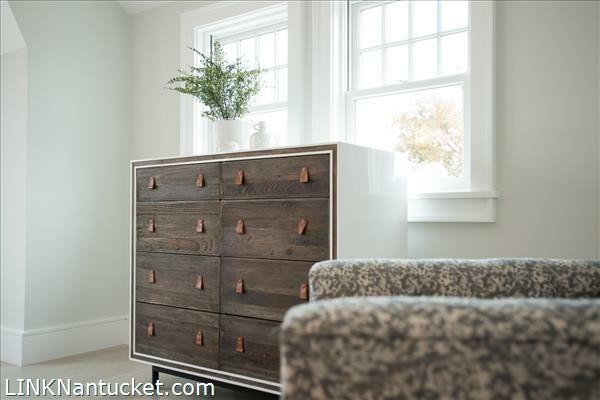 The decor, exquisitely executed by Nantucket Looms and Elisa Allen Design tastefully compliments the bright interiors, blending comfort and sophistication for modern living. 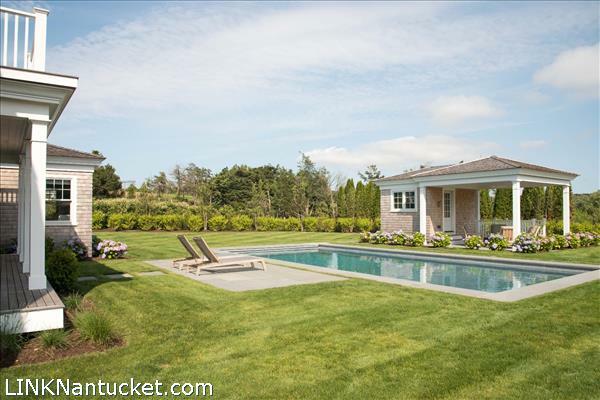 This one acre site includes a garage with unfinished 2nd floor living space, an 18×40 Gunite Pool surrounded by a bluestone patio, and a pool cabana with half bath. 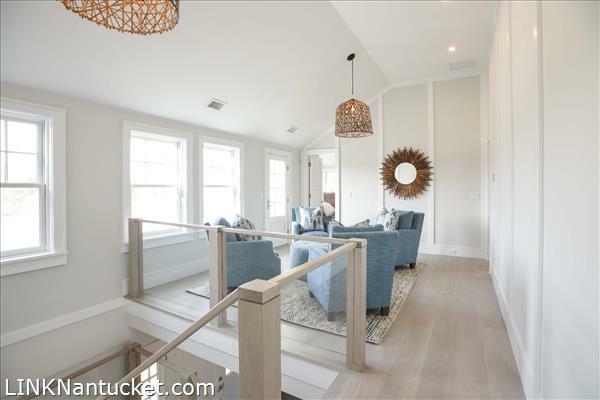 First Floor: The foyer on the first floor opens to a bright and airy open-concept floor plan with clean, crisp lines accentuated by the engineered white oak flooring. 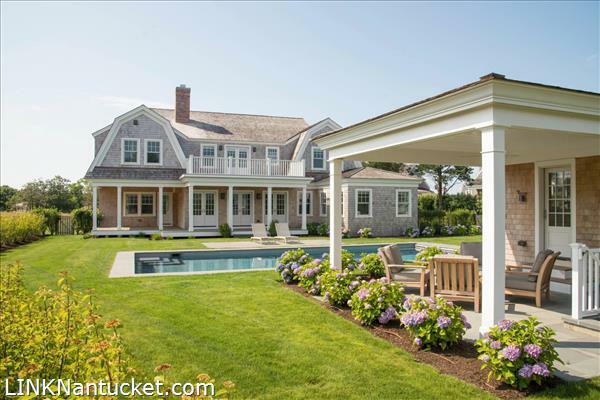 The eye is drawn to the pool, cabana and outdoor living space through the multiple french doors which fill the room with light. 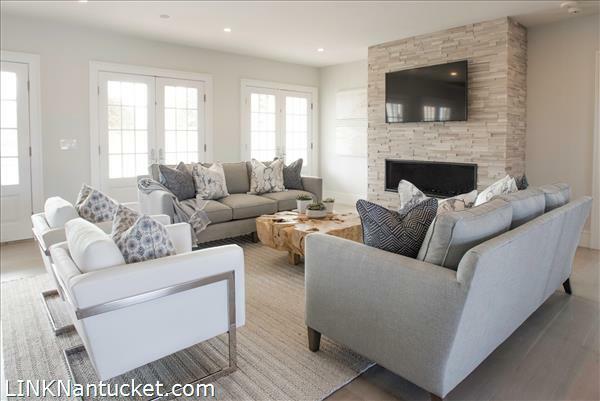 The living area has a modern gas fireplace enclosed in white birch granite. 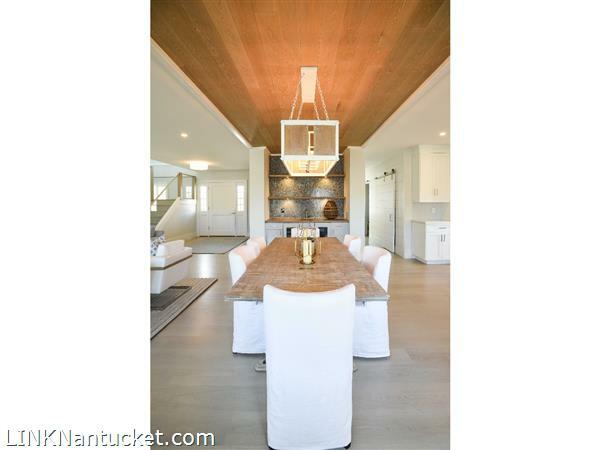 The unique white oak ceiling above the dining table lends a contemporary element to the design and feel of the space. 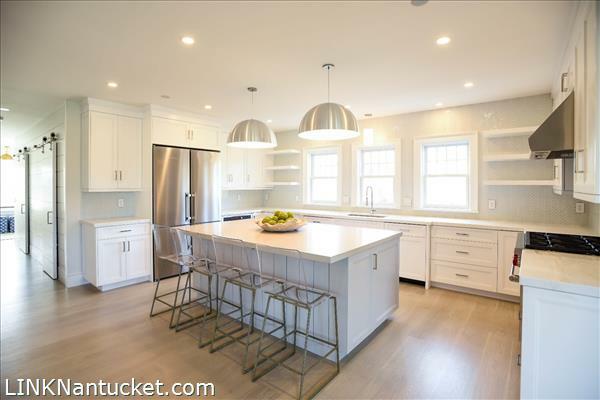 The large chef’s kitchen with high-end appliances boasts a large Caesarstone island with surrounding counters of beautiful white rhino marble. 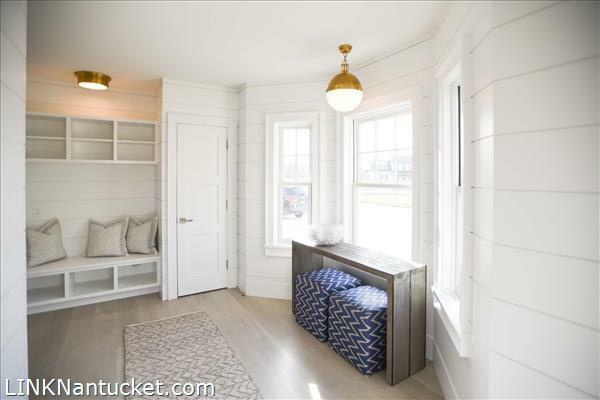 A short hallway to a secondary entryway/mudroom, half bath and built-in office workspace features two sliding track doors, one opening to a pantry, and the other to a large laundry room. 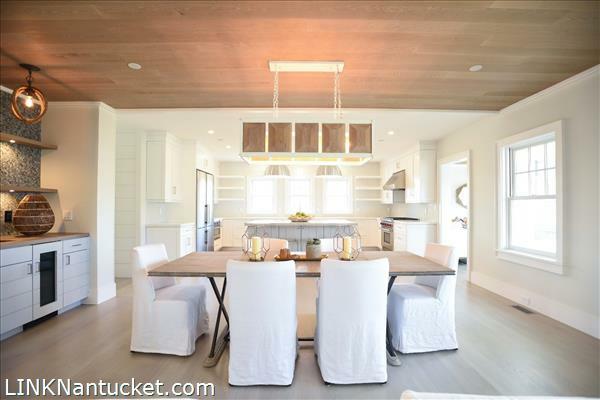 Beyond the kitchen is a second living area with a stunning vaulted oak ceiling. 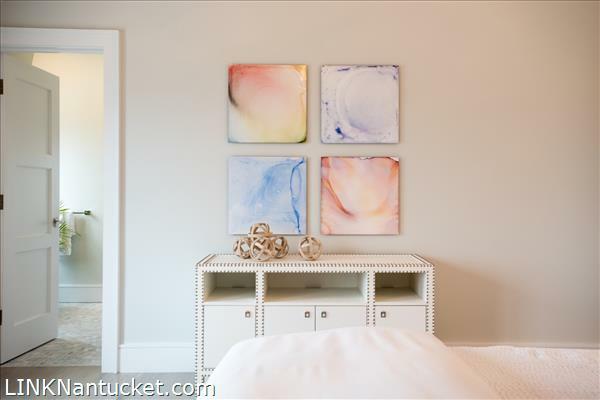 On the right of the foyer, a spacious first floor master bedroom suite has private access to the patio. 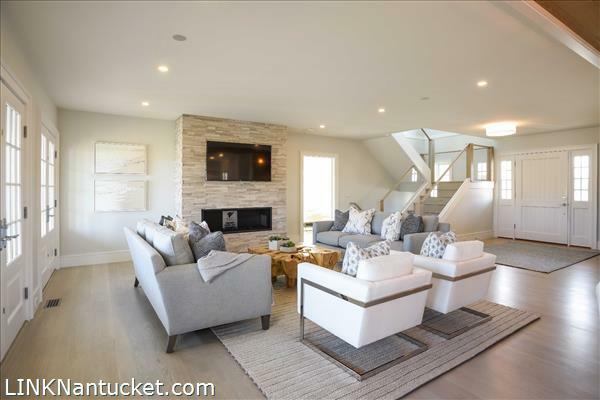 Second Floor: The tempered glass-encased staircase leads to the second floor and opens to a vaulted living room with a stylish board and batten wall treatment. 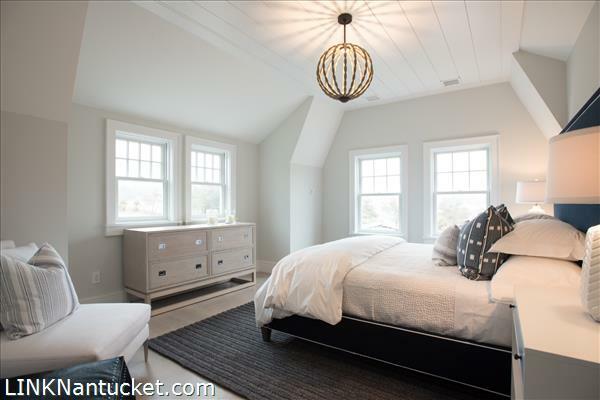 The master bedroom with access to the second floor deck overlooking the pool, boasts a walk-in closet and a large master bathroom with stand alone tub. 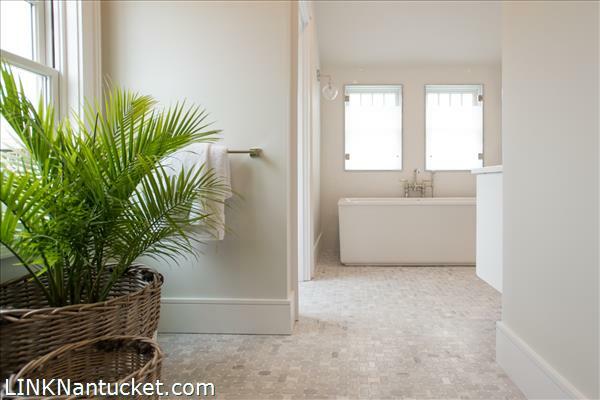 The tile here and throughout the home, exquisitely chosen by Elisa Allen varies in design in each of the bathrooms lending an individual appeal to each space. 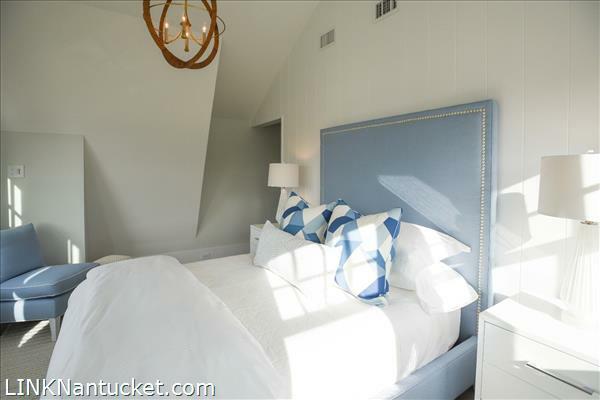 Three more spacious bedroom suites satellite off the living space. 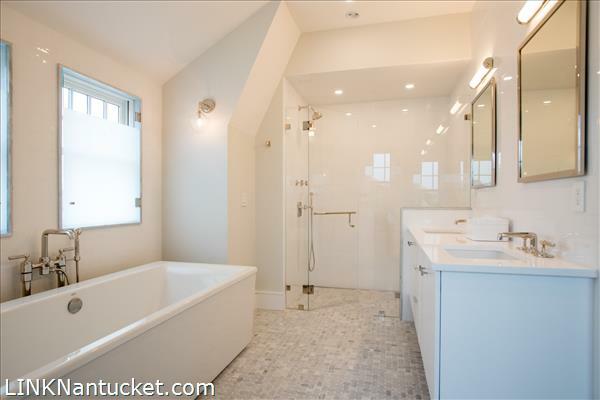 Basement: The lower level has 2300 sf of unfinished space ready to be finished to the buyers’ specifications and is plumbed for two bathrooms.